So last week I decided to take a break from swap sewing and concentrate on sewing up a few projects related to baby #2. Nothing like waiting until a month before your due date to start your sewing projects! After I made my MIL a Poolside Tote for Christmas, I just knew I needed one as my hospital bag. I just didn't have enough canvas in my stash to make one. Then I couldn't decide on what canvas I should use (go figure). So over Superbowl weekend, my favorite quilt shop Stitched Studio was having a big sale and they had some Koi Canvas on sale!!! Then I found some of Kate Spain's Daydream collection on sale for the lining and I had my fabric! I have a few of the essentials packed, just waiting until I'm a little closer before I finish packing. 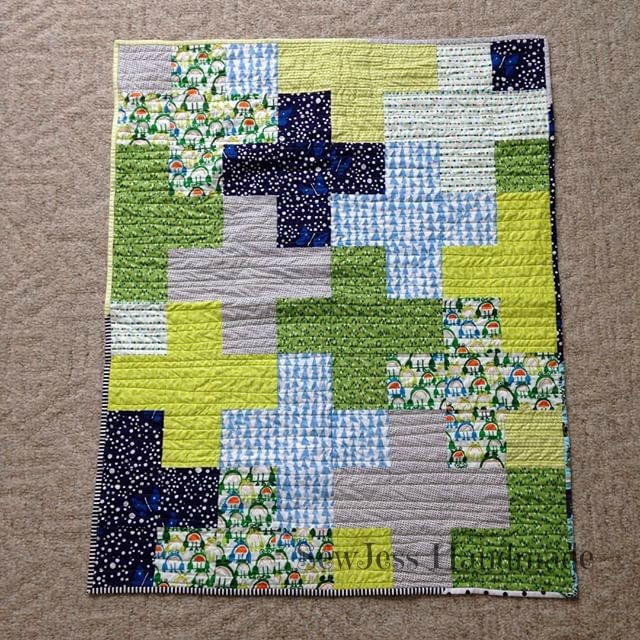 When I had Nora, I was very new to the world of quilting. Heck I had just recently started sewing again and didn't really have a clue what I was doing. Well with this baby, I have a little more sewing and quilting experience under my belt and I wanted to make her a baby quilt. So I chose a range of fabrics in my favorite colors, blue & green. And the best part of this quilt is that I was able to create it entirely from my stash, including the backing and binding. I love that is has a mix of some of my favorite fabric designers: Lizzy House, Ed Emberley, Bonnie & Camille, V and Co., and Art Gallery. Now I have my baby related sewing done, so I guess I'm has ready as I'm every going to be. Time to finish up as much of my swap sewing before baby decides to show up!